Like most avid campers, we are always trying to find the ultimate tent. Although there probably isn’t such a product to fit every situations, we have found a great tent for car camping that can be used even during the bug season. Introducing the Eureka Bon Echo Tour 600. We have been eyeing many similar tents. Ones with a screened front with panels for increment weather, large enough for a double mattress, standing room and built of quality construction. Although many fit some of these requirements, we finally found one that had all. The Bon Echo Tour 600 has a large screened-in front vestibule large enough for a few chairs and a table with full tie down panels for privacy. The panels can be fastened down in case of rain and high winds. The vestible has a floor that can be rooled up out of the way if you rather. There are bottom flaps to help keep the bugs out. This area can safely store a lot of camping equipment keeping it clean and dry. The main section of the tent is 9x12ft (2.75x3.66M) and 6’6” tall (2M). The centre has a ceiling-to-floor curtain in case you want two separate room. Since it’s rated as being able to sleep 6, it would make a great family tent. It’s very large for the two of us. The aluminum frame is smartly designed with pre-bent shoulder sections to provide near verticle walls, so standing up is possible away from the centre of the tent. There is also an ample sized back vestibule to store things out of the way such as chair bags, tent bags, etc. The zippers are heavy duty and the windows are massive. It was really nice to sleep with the front wide open and the flaps up, giving us a huge view of the woods with 2 layers of screen between us and the bugs. The back window also doubles as a door for dual access making the set up even more convenient. The tent handles the wind well and, so far, has been fully waterproof during this year’s wet spring and summer. It is a little harder to set up than a simple dome, but that would be expected for a more complicated design. 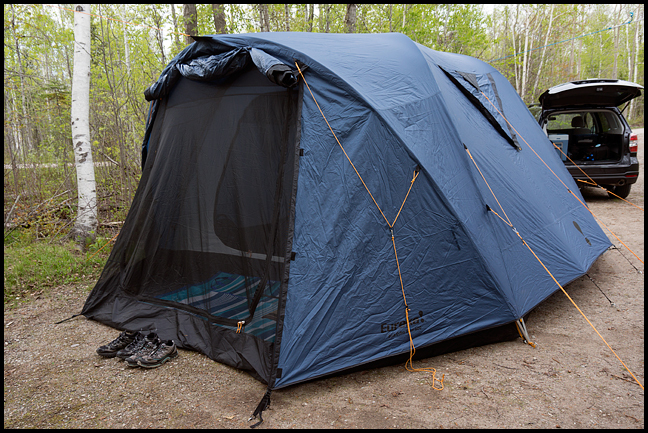 We used the tent in MacGregor Point Provincial Park in May. Plenty days of rain and cool weather and the tent stood up to the challenge. The vestibule proved very valuable for sitting during the downpours and kept everything dry at night. 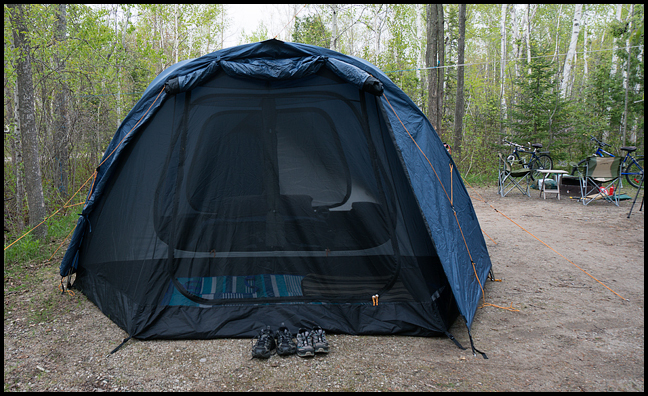 The double zipper system (vestibule & tent), helped keep the pesty mosquitoes out of our sleeping area. We put the tent to the test in June in Algonquin Park of this year when the bugs were at their worst. And that’s no lie as the mosquitoes and blackflies were the beyond annoying and swarms never before endured. The tent kept out the bugs amazingly. The year before, we brought our tent trailer and it was impossible to keep the mosquitoes out; it was like they were coming through the walls and floors. We had to buy a separate bug net for inside the trailer after spending a couple of sleepless nights being pestered all night long. This year, we slept without interruption as the Bon Echo 600 was completely bug free (once we got the mozies that followed us in on our clothes, of course). This tent is for car camping. Way too heavy and bulky for canoe tripping. It weighs in at 14kg (31lb) and is a 76x28cm (30”x11”) brute when folded up in it`s tent bag. We also have the older Eureka Bon Echo 8 (see the review for this one here). When we purchased it, we were misled as we were told the vestibule had a screen. It did not. The screen was key for camping during the thick of bug season. Therefore we purchased the Eureka Bon Echo Tour 600. We are so glad we did. It is an awesome tent.